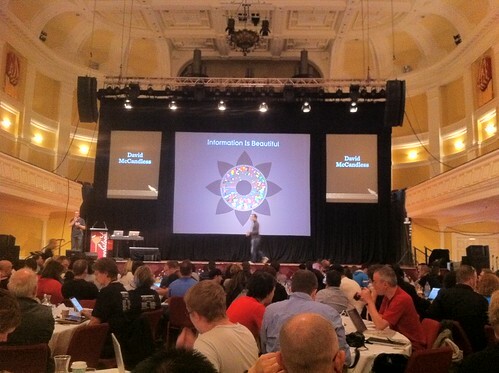 Attended Webstock again this year with a group from work (Xero was the main sponsor which was awesome!) – even though some of the talks last year were a bit blue sky for me, I was glad to attend again this year even though I was left feeling rather shattered after 2 days in a darkened hall with 800 other people just listening and taking stuff in – rather different from the day-to-day hum drum. As a sponsor we got to host a couple of the speakers for a chat and lunch in our office and The Mister got to meet one of his internet heroes Steve Souders from Google. Again with the random notes I took, sometimes something the presenter said, sometimes a thought that popped into my head while they were speaking – read no further if conference notes aren’t your thing, I just wanted to write them down somewhere. I did feel a bit like I did last year where I didn’t ‘get’ it – I didn’t emerge having identified a particular theme or trend as others did, I wasn’t wowed by any new inventions, I thought after hearing a couple of things that I might change my ways but doubt that will happen – this all sounds like I was disappointed but I wasn’t! Well, perhaps disappointed in myself for not getting more out of it seeing as everyone else was raving that they did (or perhaps it’s like The English Patient that everyone crooned about, yet I felt like the only person in the world who didn’t enjoy it). 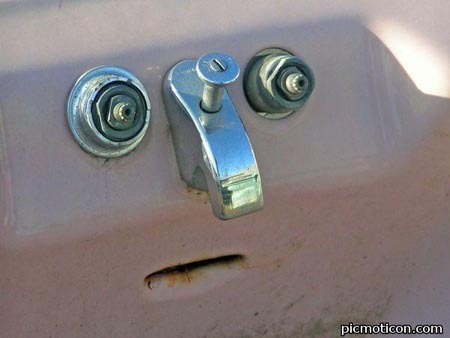 says we should ‘warm up’ our content and language, gave the example that you don’t describe your significant other as ’72.8% water’ – factually correct but not very personable! make it work – managers should encourage ‘skunkworks’ projects and developers need to find a way to make their work fun, if you can’t you should quit. If you want to be that guy that does that thing – pick a thing and go do it! But it has to be the right thing. Played the accordion. Was kind of spine tingling in that setting. As mentioned above, didn’t understand a lot of this, although it wasn’t totally foreign to me as I’ve been to a few of The Mister’s talks on the topic of performance and also sat through a few of his practice runs! Before you write any web content think: what, why, for whom, how, by whom, with what, when, how often, what next? DELIGHT. When was the last time you experienced true delight? Your city lights at night? A movie? An experience? People like you, geeks like you will ‘get’ your product – should aim for the non-geeks as typically that’s the larger customer base. Absolutely fascinating. The collection, curation and storage of data that is pumped out as amazing infographics. Stuff about the environment, human behaviour, spending habits, comparison of trends and events. That saying ‘a picture paints a thousand words’ is true in this case, and seeing numbers of things or values of things represented as different sized boxes is quite compelling and in my case easier to understand – even things like national debt of various countries. Suggested Webstock was on a break-the-rules theme and had some wise words on the topic. Traditional bloggers have rules, like the roles of VIPs and sales guys – there are no hats and no departments in the startup world – just get on with it and make a good product – it’s everyone’s responsibility. Even if you don’t have a fancy title or hat, you might not understand but you can comprehend it. Give yourself credit. If there was a table with 3 chairs at it in your life, in your future, who would be sitting there with you? Talked about The Grimace Project – facial expression sliders – learn to recognise one or more emotions in a face. So no big themes for me, just a whole lot of interesting stuff. And the realisation surrounded by smart phones that I just don’t have any apps on my phone. About 4. We definitely have to spend more time together – I too felt overwhelmed by 2 days of awesome presenters, and also didn’t quite get English Patient. As soon as we got home my wife and I held the tea towel up figuring out where to hang it. That way the kedgeree recipe is always in sight. Thanks for hosting me. 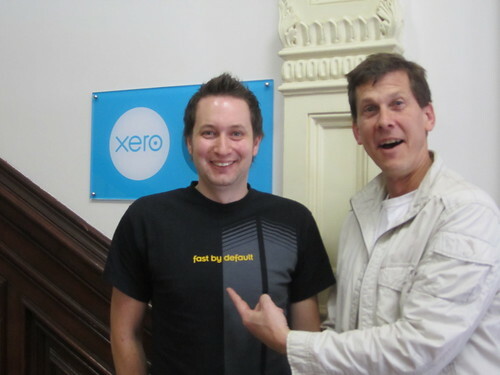 It was great meeting the Xero team. Well I feel pretty special right about now And I’ll be letting Nikau Cafe know their tea towel is a treasured possession!